The #4 Survival knife is modelled after Grohmanns original knife. 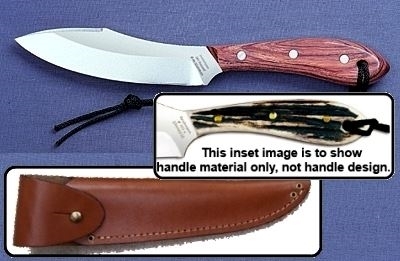 A favourite for hunters with larger than average hands and also as a generous outdoors knife. The Grohmann features overlap sheath for added security. Grohmann takes pride in their products and that means using high quality materials. Their carbon blade knives are made from a C70-type European carbon steel from Germany. Carbon steel blades should be kept cleaned and oiled to prevent rusting. Carbon steel blades tend to hold an edge longer and sharpen up faster than the stainless, but they will corrode if not kept cleaned and oiled at all times. When carbon knives leave the Grohmann factory, the blades are oiled with non-toxic mineral oil and wrapped in wax paper to preserve the blades. Carbon will corrode if not kept cleaned and oiled, this is the nature of the beast, so be sure to wash your knives after use, dry and apply a light oil.